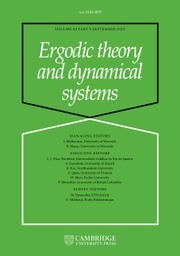 Ergodic Theory and Dynamical Systems focuses on a rich variety of research areas which, although diverse, employ as common themes global dynamical methods. The journal provides a focus for this important and flourishing area of mathematics and brings together many major contributions in the field. The journal acts as a forum for central problems of dynamical systems and of interactions of dynamical systems with areas such as differential geometry, number theory, operator algebras, celestial and statistical mechanics, and biology.